Can Dogs Eat Butternut Squash? Can You Take A Dog On A Bus? Can You Take Your Dog On The Tube? 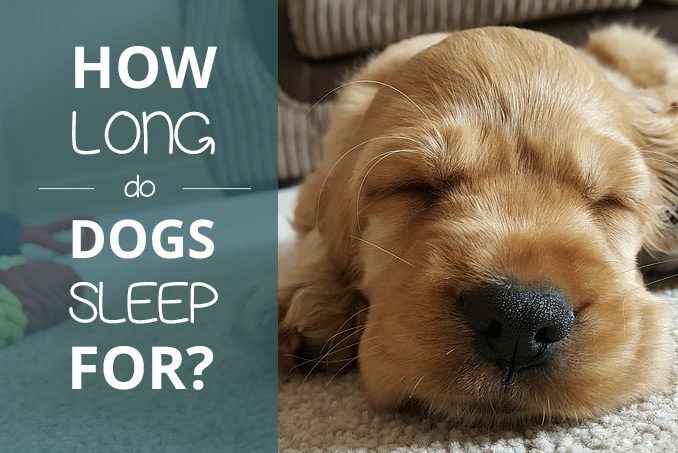 How Long Do Dogs Sleep? 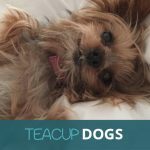 Are you curious whether your dog’s sleeping pattern is normal? What is considered a regular sleeping pattern for one dog may not be the same sleeping pattern for another dog. So, how long do dogs sleep? In general, dogs sleep around 12-14 hours a day. The specific amount of time that a dog spends sleeping will depend on several factors. As a pet owner you have some influence on your dog’s sleeping hours. Other factors are related to a dog’s breed and age. 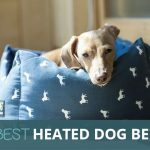 Read on to find out whether your pooch is snoozing enough. Getting enough sleep is vital for a dog’s health. Though you may notice your dog spending most of the day with her eyes closed, Rover is probably only napping. It is more difficult for a dog to enter into REM sleep, the deep sleep stage. Thus, dogs take naps regularly to accumulate more time in REM. If your dog doesn’t sleep through the night, this may be an indication of lack of stimulation. 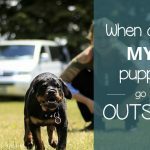 A dog that doesn’t receive enough stimulation will find a way to release their energy in the house. Lack of stimulation may be why your dog resorts to chewing and other unwanted behaviour. Make sure your dog gets enough time for play and walks to manage their sleeping hours. If you notice any sudden changes in your dog’s sleeping pattern, this may be an indication of underlying health conditions. 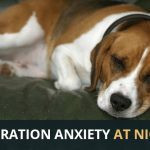 If your dog barely sleeps then your furry friend might be suffering from insomnia. Dog insomnia is usually only a symptom of an underlying uncomfortable health condition such as kidney and thyroid problems or arthritis. A dog that is significantly sleeping more combined with fatigue may suffer from narcolepsy or sleep apnoea. If you notice any unusual changes in your dog’s sleeping pattern, consult your vet. The breed of your dog may be an indicator of how many hours a day he will sleep. As mentioned, more than half of a dog’s day is dedicated to naps. However, between breeds there may be a few hours of variation. A general rule is that the larger the dog, the more hours of sleep. There are also a few small and medium breed dogs that are known to love to snooze. The Newfoundland, Bull Mastiff, Saint Bernard and Great Dane are all large breeds dogs that are also sleeping giants. Where the average sleeping hours for a dog is 12-14 hours, these large breeds may sleep up to 18 hours a day. This may have to do with their mere size. Their bodies need more energy to carry around their weight and thus also more sleep to re-cooperate. A few examples of smaller sleepy dogs are the French Bulldog, English Bulldog and Chow Chow. French Bulldogs and Chow Chow make for great city apartment pets because they are essentially sofa dogs. A French Bulldog and Chow Chow will choose to snuggle with their owner and snooze around instead of long walks and active play. The English Bulldog’s broad chubby build is already an indication of its laziness. Their low demand for exercise is hereditary as English Bulldogs are prone to overheating and breathing problems. These three breeds prefer to run around in their dreams instead of in the woods. Another notable sleepy dog is the Greyhound. Greyhounds are only active for a few hours a day and can sleep up to 20 hours. This is the Greyhound’s way to conserve its energy for the fast running he does when he is awake. Then there are dog breeds that were bred to do farm work or hunting. Sheepdogs, for example, were bred to guard the livestock and will sleep less during the night time to watch over its herd. A hunting dog such as the Rhodesian Ridgeback is also more alert at night. Hunting dogs have better night vision than humans which makes for easier spotting of prey. These night time workers will sleep more during the daytime as this is when they are ‘off-duty’. If such breeds are only companion dogs though, then their sleeping schedule will differ depending on their activity level. The activity level of a dog will also influence their sleeping pattern. 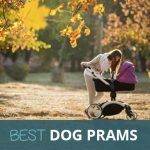 If you’ve had a notoriously active dog breed like terriers, then you’ll know that some breeds need more exercise and mental stimulation to keep them calm the rest of the day. For the most part though, dogs will adjust their sleeping pattern to their owner’s schedule. Dogs that have jobs such as the previously mentioned farm dogs, but also therapy dogs and police dogs, are trained to stay alert during their working hours. Dogs trained for a specific job will be able to sense when their owner needs them and when they can relax. Their sleeping pattern will then naturally also closely reflect their owner’s rhythm and job schedule. Dogs that are left at home while their owner is at work will mostly use the office hours to sleep. Dogs are pack animals and like to socialise. By sleeping while their owner is gone, the dog will have more energy to play and socialise when their owner comes back. Throughout their lifetime, a dog’s sleeping pattern will change. Little puppies, like human babies, need more sleep to grow. Puppies are only active in short bursts before falling back to sleep. 20 hours of sleep a day is common for puppies. Dogs sleep less during adulthood but will sleep more once they’ve surpassed adulthood. Senior dogs, like their puppy counterparts, will require more sleep to maintain their energy levels. So yes, your canine companions sleeps much more than you do. Unless there are sudden significant changes, you don’t need to worry about your dog’s sleeping pattern. 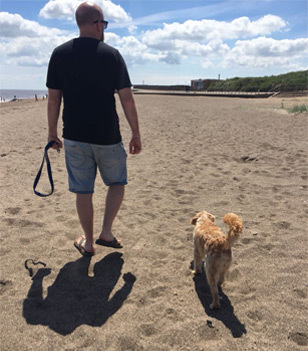 This site is run by Mike and Simon who are both massive dog lovers. To read more about us please read our about us page. How Long Do Labradors Live? PoochingAround.co.uk is a participant in the Amazon Services LLC Associates Program, an affiliate advertising program designed to provide a means for website owners to earn advertising fees by advertising and linking to amazon(.com, .co.uk, .ca etc) and any other website that may be affiliated with Amazon Service LLC Associates Program. 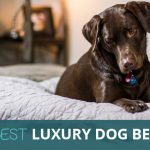 Best Slip Leads For Dogs?